We took the camera on walkies today. Forsaking the less weedy residential streets of our daily quest for a slimmer waist and a fatter pocketbook, we concentrated on the lower end of Marginal, where abandoned parking lots and neglected, perfunctory "ornamental" plantings in front of industrial concerns provide the perfect setting for plants -- i.e., weeds -- who like to do their own gardening. 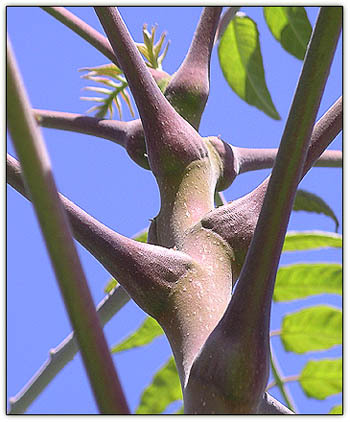 Like Goethe's "frozen music," the balletic branching structure of the young Ailanthus (above) as it spirals heavenward is a physical expression of the dynamics of plant growth, as formulated in The Fibonacci Series. Click here for an elegant video explaining The Fibonacci Series. Update: A visually dazzling animated video tells the same story. 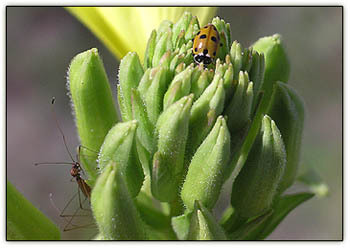 The bud cluster of a Sundrops (Oenothera fruticosa) had aroused the interest of a foraging ladybug. While we were focussing on her, an unidentified long-legged insect (lower left) made its way into the camera's field of vision, unbeknownst to us until we got the image up on the computer screen in Photoshop back in the studio. Unlike other members of Onagraceae -- the Evening Primrose family -- whose flowers open at twilight, Sundrops open during the day. They bloom all summer and are propagated by nurserymen for home gardens. Image = x 2.5. Bug's-eye view of a Sundrops bud cluster reveals four-eyed pod people schooling through the ether. Red "eyes" are actually the sepals, which "will peel back and curl downward as the flower spreads out its petals." Ripe fruits (x 4) of native woody vine Virginia Creeper (Parthenocissus quinquefolia) suggest miniature Concord Grapes, as might be expected from a fellow member of the Grape family, Vitaceae. 'Wonder what kind of a wine you could make of 'em? 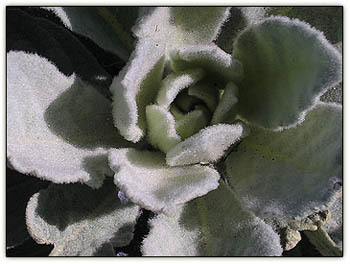 During its first year biennial Common Mullein (Verbascum thapsus) -- a member of the Figwort (Schrophulariaceae) family -- produces a rosette of thick, velvety basal leaves. With plants like this, who needs teddy bears? Its time come, the ripened pod (lower left) of a Black Swallowwort vine (Cynanchum nigrum) had burst forth with new life, each seed launched on a puffy parachute of silk. Not surprisingly, the Swallowwort is a member of the Milkweed subfamily, Asclepiadaceae. Classification update: Black or Louis’ Swallow-wort (Cynanchum louisea, previously Vincetoxicum nigrum and Cynanchum nigrum). Some spell it with, some without the hyphen between swallow and wort. 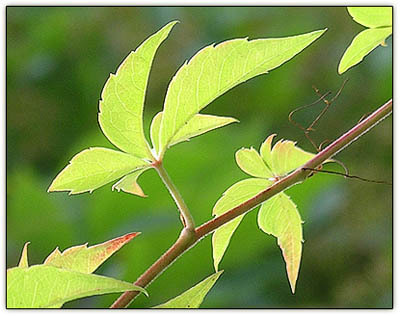 AKA Dog-Strangling Vine, it is listed in the "Invasive Plant Atlas of New England." 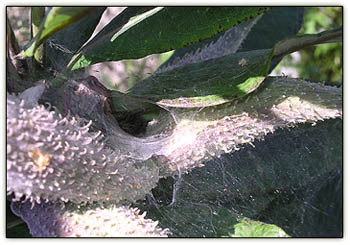 A close relative of the Funnel Web Spiders in our own backyard had set up housekeeping among a cluster of milkweed pods in the verge along Marginal Street. The doctor was in. 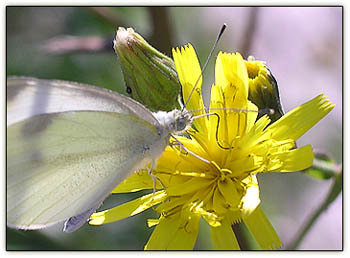 The ubiquitous Cabbage Butterfly -- AKA Cabbage Moth -- was on the scene, taking its fill of the intoxicating nectar of a Canada Hawkweed (Hieracium canadense). Both my grandmothers and all their many sisters would have loved her post. Expeditious ladybug navigates the vinyl-cladded chain link fence that encloses an abandoned parking lot along Marginal Street this morning. Gray-green leaves and pink flowers of Common Milkweed (Asclepias syriaca) backdrop are part of one of those beauty-in-unexpected-places "Unplanted Gardens" Fred First has been writing about. We headed out for walkies this morning, camera in hand, with Fred's Unplanted Gardens: America's Roadside Bloomery project -- blogged here yesterday -- in mind but quickly found his simple and reasonable-sounding requirement that "all images would include in their composition a road of some kind, just to place it," too restrictive for our particular brand of photographic vision, which tends to go for the up close and personal, not to mention the Cartier-Bresson "Decisive Moment." 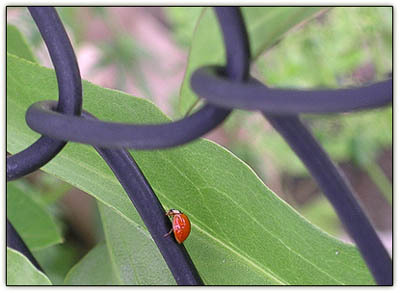 Take the ladybug on the chain link fence above, for example. To get Marginal Street -- which was behind us as we clicked the shutter -- in the picture, we would have had to gain access to a locked parking lot. Had that even been possible, the ladybug, crawling precipitously in and out of our camera's field of vision, would have been long gone. 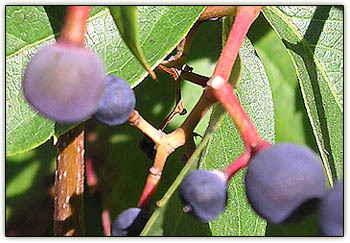 Know what these are? We didn't when we discovered them the other day milling about, newly emerged from their eggcases, on the underside of a Common Milkweed leaf in our volunteer weed garden in front of the fence at the edge of the yard. Inspired by photographer, writer and naturalist extraordinaire Bev of Burning Silo -- who had advised her readers that "Milkweed is always one of the very best plants to watch for insect and spider activity" -- we had been looking for spider mothers and their young when we stumbled upon the nurseryful of six-legged creepy crawlies above. 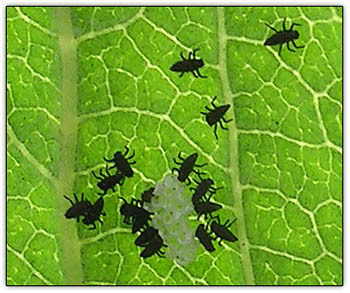 Googling today, we discovered they were ladybug larvae. Update: Or are they green dock beetle larvae? Like its kissing cousin, Boston Ivy (Parthenocissus tricuspidata), fellow grape-family member Virginia Creeper (Parthenocissus quinquefolia), above, is a lovely native woody vine widely grown as a climbing ornamental to cover the façades of masonry buildings. According to Wikipedia, "This usage is actually economically important because, by shading walls during the summer, it can significantly reduce cooling costs." Maybe Al Gore could use it on that Tennesse trophy mansion that uses up more energy in a day than most of us do in a year. 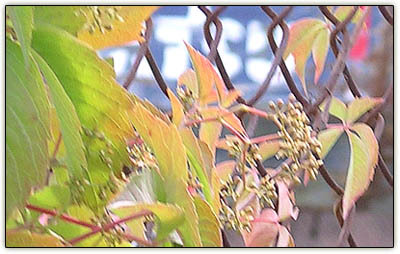 We caught another Decisive Moment (above) as the sun emerged from unsettled, partly cloudy skies to backlight the five-parted compound leaves of a single stem of another roadside garden volunteer, Virginia Creeper (Parthenocissus quinquefolia) against the darker green of unlit branches behind, clinging to yet another of Marginal Street's ubiquitous neglected chain link fences. More light play with Virginia Creeper on its rusty roadside chain link "trellis," with some sort of heavy equipment (blue with white letters) behind. We should have taken notes. 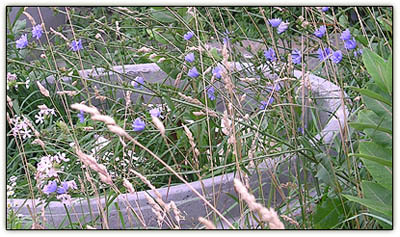 Crepish lavender Common Chicory (Cichorium entybus), pale pink-and-white Bouncing Bet (Saponaria officinalis) and tall, tawny grasses conspire to turn a roadside concrete drain pipe section left over from a recent infrastructure project along Marginal Street into a container garden. 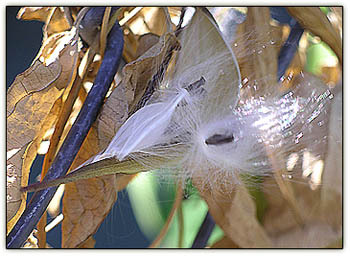 Large-leaved Common Milkweed lends contrast, stage right. 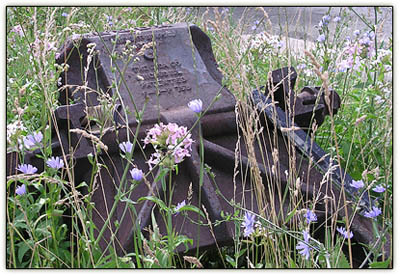 Back for an encore, Common Chicory, Bouncing Bet and the tall grasses arrange themselves with wit and whimsy around an abandoned truck accessory or some such cast-iron relic made by the Buda Engine Company of Harvey, Illinois and left along the roadside a ways down Marginal. Their landscape solution called to mind a war memorial of perhaps Civil War vintage, in this case a remembrance of victims of the eternal war of supply and demand. There is a place for spinelessness in this world -- check out the 10th Circus of the Spineless at Science and sensibility to see what we mean -- but our species are supposed to have backbones. Multicultural elites "gripped by self-loathing," in Amir Taheri's words, need not apply. "This Islam is an ideology masquerading as a religious faith," writes Amir Taheri in a most enlightening Wall Street Journal commentary on the occasion of the first anniversary of the London bombings. "According to intelligence sources quoted by the British press, some 8,000 persons, all 'British born and bred Muslims,' are under investigation as 'al Qaeda sympathizers'"
Will we finally get it this time? She: Bit by bit, you are helping people to stop and view the Joe Pyeweed. I almost felt guilty during my weeding. We: I always do. Especially when I come upon babies of my Silver Maple. Or anything I can identify, which is just about everything. She: LOL. Yes, maples are the hardest to kill. Whatever happens to you in your life, Sis, you are as great an artist as any.You have that "thing" that true artists have -- and I mean artists in any of the seven lively arts -- an eye that others don't have, but can occasionally be shown a glimpse of. An unplanted roadside garden right beneath our feet at the bottom of the front steps caught our eye this afternoon with blue-green Doorweed -- AKA Prostrate Knotweed -- (Polygonum aviculare) spreading its knotted stems over the warm gray-and-peach New England granite curb and reaching out over the cool gray of the asphalt pavement below. A sudden summer shower had created an unplanned reflecting pool, where lacy gray-green Silver Maple (Acer saccharinum) leaves offset a single spring green leaf from a volunteer apple tree in the lot next door. A shocking pink rose petal (in the crack, lower left) had blown across the street from Eastern Salt's rosebeds, adding a striking color note to the low-key grays and greens of the overall composition. We're entering our picture in Fred's aggregate gallery of "America's Roadside Bloomery," described below. Each image should be 72 dpi, max size of 800 pixels on the largest side. Information should minimally include the location, if possible some ID on the flowers, and any other pertinent or interesting information . . . I will upload them to a public gallery on Smugmug. 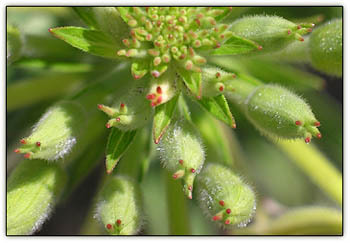 Click on over to Fred's for full details re submitting your own favorite unplanted garden images. As for ourselves, besides the curbside Doorweed garden above, we're thinking about a volunteer espalier of Hedge Bindweed growing on an old chain link fence we saw down the pike the other day, not to mention dozens of other examples of our signature "beauty in unexpected places" that always crop up on daily walks around town. If you're so inclined, please join in. The more the berrier. When plants decide to garden, they don't yell "timber!" 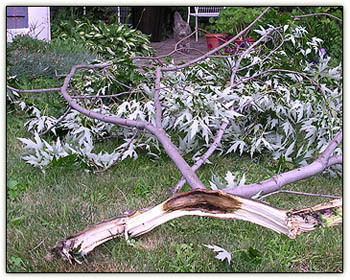 In the high winds of a brewing thunderstorm this afternoon, the Silver Maple that dominates our side yard decided it was time to prune one of the large upper branches. Note Baby, top center, trotting out to inspect the damage. Tiny was off to his right in the little house, adopting a wait-and-see attitude. Speaking intimately to the pussycats, who were out on their tethers, we didn't even notice anything was amiss until Tuck happened outside and declared how lucky we were that the heavy branch hadn't crashed down on the animals or any of the garden plants. Instead it had fallen onto the lawn just beyond the parterre garden, taking only a few petunia petals with it. 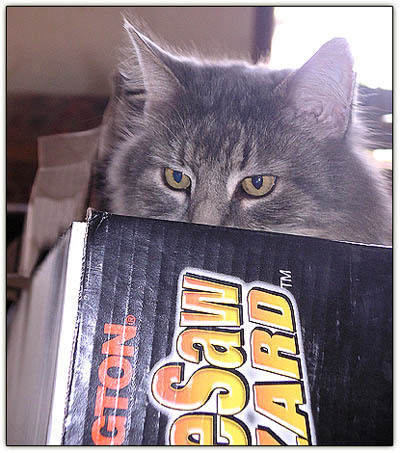 In the manner of cats, Baby commandeered the box Tuck's new pole chain saw came in the other day and made it his own. As we wrote a couple of years back, quoting Winston Furchill, "There is no bag or box that a cat cannot conquer." You don't suppose the Silver Maple knew that Tuck had just purchased a new Remington Electric Pole Chain Saw from Home Depot and was planning to go after some of those high branches himself? Are plants -- like cats -- always in control? Update: Modulator's Friday Ark #146 reports the heartbreaking news of our precious Mind of Mog's loss of her beloved Krissie. God bless.